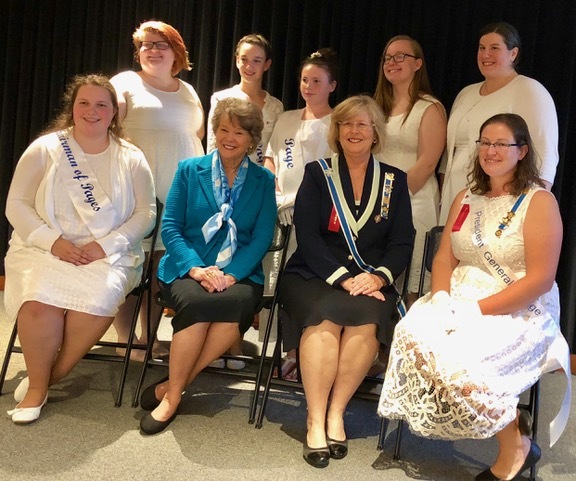 After a week of meetings and work at 1776 D Street, I was looking forward to a return visit to the beautiful state of New Hampshire and an opportunity to see Wendy Stanley Jones, State Regent, and the many Daughters I had met in 2017 when I visited Cathedral of the Pines. Wendy met the flight and we toured some historical sites giving me a new appreciation for the role New Hampshire had in the American Revolution. September found New Hampshire Daughters excited with the anticipation of President General Ann Dillon’s state visit. Host chapters were Anna Keyes Powers Chapter, Exeter Chapter and Pemigiwasset Chapter. While they were preparing for the Hospitality room at the hotel this officer picked Mrs. Dillon up at the airport for a short ride to American Revolution War Capital Town of Exeter. Lunch with Bea Dalton, Honorary State Regent and Past Treasurer General, included a delightful lobster roll before exploring Exeter. Exeter has the Congregation Church that Abraham Lincoln spoke at when he was in town visiting his son at Phillips Exeter School. Past the school is Gale Park War Memorial, the park donated in honor of General Stephen Gale, his statue created by Daniel Chester French, who also created Abraham Lincoln’s sculpture in Washington D.C.
Then we visited Winter Street Cemetery whose earliest grave is from 1742 on land donated by Colonel John Gilman, where more than a dozen Revolutionary War soldiers are buried. Exeter Chapter has adopted this cemetery and helps maintain its care along with placing Wreaths across America on its veterans’ graves. A short drive took us to the American Independence Museum which was founded in 1783 by officers of the Continental Army and their French counterparts who served together, created the Society of the Cincinnati and their descendants to preserve the patriotic sacrifices that made America a reality. Linda Biagini, Exeter Chapter regent was able to join Mrs. Dalton, Mrs. Dillon and I as we were able to see the Dunlap Broadside draft, perhaps one of three Purple Hearts of Washington’s, and other Revolutionary artifacts and replicas. As we left we were able to see the Powder House built in 1771 that housed powder taken from Fort William and Mary December 14, 1774 in the first Revolutionary battles and then found its way to the Battle of Bunker Hill. The Powder House was restored in 1999. Then we journeyed to Manchester for a casual dinner with New Hampshire Honorary State Regents, state officers, New Jersey State Regent Karen Stroever and DAR member and Development Director Sandra Pollack. Saturday morning Mrs. Dillon hosted the Heritage and Founders Club breakfast, giving all who attended an update of National vision and projects. Opening ceremonies included Southern New Hampshire University ROTC Color Guard; Joyce Craig, the first female mayor of Manchester, who brought greetings from the City and President Dr. Patty Lynott, Southern New Hampshire University College, warmly greeted the members and joined us for the meeting as she is a thirty-year DAR member. While Mrs. Dillon and Mrs. Stroever were seeing these special sites in Manchester, the members discussed the bylaws revisions chaired by Dr. Sarah Voll. Every member who wanted to, had the opportunity to speak. The bylaws passed, as did the budget in the afternoon. Mrs. Dillon was our keynote speaker for lunch. Members were moved by her leadership and guidance for us to take pride in who we are and what we do as we move forward in service, building sustainability within our chapters and state. She charged us to help each other, reach down and raise up the next generation of leaders. Mrs. Dillon was able to recognize the members who finished the New Members course under Elaine Bean, Chair, Honorary State Regent and the New Horizons course under Dorothy Howard, Chair, State Vice Regent. The afternoon session’s highlight was Marilyn Pratt-Holmquist’s Constitution Week Proclamation followed by Mary Tedesco’s “Researching Minorities and Women in the American Revolution” program. #TBT 125 years ago, on April 19, 1894, the Sequoia Chapter in San Francisco, California, planted a �... 19 hours 34 min ago.